Earlier in the year, Google announced the first phase of its Google Music service. 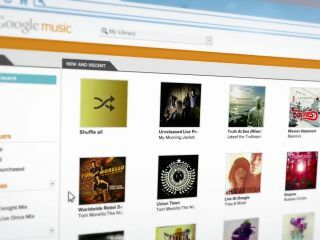 The cloud-based offering enabled beta users to upload their own music collections, which could then be streamed to any device. But now Google has taken this further, "evolving the service into a broader platform" - Google Music. Essentially this means that Google has launched a music store to go alongside its cloud storage offering - and you'll be able to sync tracks between your desktop PC and Android devices. "Google Music is about discovering, purchasing, sharing and enjoying digital music in new, innovative and personalized ways," says Google's head of mobile Andy Rubin. Google is certainly intending this as a service for use primarily on Android-toting phones and tablets. Google is intent on competing with Apple's iTunes Store, Amazon, which launched a cloud service in the US in March as well as streaming services such as Spotify, Deezer (both now launched in the UK and US) and Rdio (not UK). Presently, the service is only available in the US. There is, as yet, no information about when – or indeed if – Google Music will be available in the UK. Google has today added a new music store in Android Market, fully integrated with Google Music. The store offers more than 13 million tracks from artists on Universal Music Group, Sony Music Entertainment, EMI, and the global independent rights agency Merlin as well as over 1,000 prominent independent labels including Merge Records, Warp Records, Matador Records, XL Recordings and Naxos. Google has also partnered with the world's largest digital distributors of independent music including IODA, INgrooves, The Orchard and Believe Digital. Songs are encoded as 320Kbps MP3s, with tracks costing 69c, 99c and $1.29. In addition to purchased music, you can store 20,000 songs on Google Music, with the limit being that number and not a definitive Gigabyte limit. That's quite a bunch of storage Google is passing on there. We guess that, in due course, you will be able to pay for more storage, just as you can with Picasa. Check out our first look of the original cloud-based Music Beta from Google service. The cloud-based element of Google Music is like the recently launched Amazon Cloud Drive. It essentially enables you to store your entire music library online and then stream the music on any of your devices. So it's like Spotify, but without subscription – as you already own your own music. The advantage is that you don't have to sync devices and/or playlists. We also want to make it easy and seamless for you to grow your music collection. Today, we added a new music store in Android Market, fully integrated with Google Music. As with Spotify, playlists are automatically kept in sync, so if you create a new playlist on your phone, it's instantly available on your computer or tablet. You can also import your existing playlists from iTunes. "Google Music helps you spend more time listening to your collection and less time managing it," says Rubin. Google has cleverly woven in offline capabilities - Google Music stores the songs you've recently played in your cache; meaning they're still available if you lose your 3G or Wi-Fi connection. You can also choose songs, albums or artists you want to make available offline, just like Spotify. Google wants to integrate music with Google+, so you can share a free full play of a purchased song with your friends on Google+. Google has also added a bunch of exclusive tracks and albums including Rolling Stones live concerts and a five-track live EP from Coldplay. Any artist can distribute their own music on Google Music (providing they own the right to do so, of course). An artist hub interface enables them to build an artist page, upload original tracks, set prices and even sell content directly to fans. Is this the end for MySpace? Google says you can stream from the cloud service to a web browser (on, presumably, virtually any device) or via the Music app available from the Android Market - it works on Android 2.2 or up. However, it seems clear to us that Google is targeting Android 3.0 Honeycomb devices in particular here.